Two different and interesting takes on leadership jumped out at me recently. 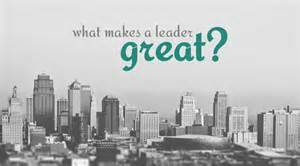 They provide completely different views on effective leaderships. In Praise of the SOB Leader: In this article, Marc Effron discusses research that looks at the impact of execution-related capabilities and people-related capabilities on performance. The execution-related capabilities — things like being persistent, organized, proactive, setting high standards and holding people accountable — have a positive impact. People-related skills like teamwork, listening, etc. do not. My question is, does focusing on the execution-related capabilities really mean that you have to be an SOB or can you display those capabilities in a way that honors the other person. 9 Surprising Traits of Truly Phenomenal Bosses: Inc.’s Jeff Haden shares 9 traits that your boss has that aren’t obvious because of what they do but because of what they don’t do. t’s these traits that he argues are what differentiates a truly terrific boss. The traits include things like forgiving and, more importantly, forgetting and allowing people to learn their own lessons. Take a look at the articles. think you’ll find a couple of really good nuggets in both of them. http://nextbridgeconsulting.com/wp-content/uploads/logo-2-new_lngc2.png 0 0 nextbridgeconsulting http://nextbridgeconsulting.com/wp-content/uploads/logo-2-new_lngc2.png nextbridgeconsulting2016-01-20 08:00:352016-12-25 04:52:41What Makes a Great Leader?